Then Toto Pulled Back the Curtain . . .
As a pastor of a congregation with a rich and influential gospel ministry history of over 110 years, I now have a front-row seat for watching the precipitous decline of ours and other Adventist and Christian churches in metropolitan Los Angeles. I can testify to how difficult it is to convince people that they should give our congregation a chance to show that following Jesus and partnering with us to live out his mission is worth their time. Most people are not listening to us. We have been tuned out. Many articles and books have been written in an attempt to explain why the decline is happening and to offer solutions on how to reverse the trend and begin attracting people to church again. While I do not propose to have a better answer to the why or the proven solution for the how, I would like to suggest what is, I believe, the reason for this decades-long trend. Next week, I will suggest a possible corrective to these fatal flaws. Then, in subsequent articles, I will provide examples of how this corrective could be implemented and contextualized in local Adventist congregations. I think the best way I can explain what has happened is to watch the 1939 film, The Wizard of Oz. For those of you who believe the film massacred the original story in L. Frank Baum’s book or if you prefer to ease on down, ease on down the road with Diana Ross and Michael Jackson in The Wiz, I respect your choices. But there are some plot differences between the three, and for this article’s purposes, we need you to stick with Judy Garland. You remember when Dorothy, her dog, Toto, and their Kansas farmhouse were swept away in the tornado and landed on top of the Wicked Witch of the East in Munchkinland? As Dorothy steps out of the sepia-toned farmhouse and into the Technicolor Land of Oz, while amazed at the magical land she has entered, more than anything she wants to return home. So, based on the advice of Glinda, the Good Witch of the North, she begins her odyssey to the Emerald City, home of the Great and Powerful Wizard of Oz, to see if he can help her get there. As she journeys down the yellow brick road with Toto at her side, she gains three companions who also need something that only the Wizard can provide: a brain for the Scarecrow, a heart for the Tin Man, and some courage for the Cowardly Lion. They finally make it to the palace of the wizard and meet his green floating head encircled with fire. Dorothy and her friends meekly approach this supernatural spirit and tell him what they each need. The green head’s booming Dolby voice promises to give them what they want if they go and fulfill the task he has for them: killing the Wicked Witch of the West and bringing him her broomstick. The four agree to the wizard’s proposal and, despite some close calls and harrowing experiences, “liquidate” the witch with water and free the Land of Oz from her tyranny. Triumphantly, Dorothy and Toto march with their friends back to the Emerald City with the Wicked Witch’s broomstick in hand. When the wizard receives them and sees that they have successfully carried out his wish, he appears to second guess his promise and tells them to leave and come back the next day because he needs to think about things. Indignant that he might renege on his promise after all they had suffered and what they had risked for him, these no-longer-timid sojourners stand up to the wizard and call him a fraud to his green fiery face. As they yell at each other, Toto notices some movement behind a curtain in one corner of the room. He scampers over to the curtain, wraps his jaw around it and rips it back to expose a man speaking into a microphone and animatedly pushing buttons and pulling levers. In horror, the four pilgrims realize that they had been told a lie. There was no great and powerful wizard: there was just this nervous humbug of a man who had created a green-screen illusion to hold onto his power. We are going to stop the film there. Don’t worry; we’ll finish it next week. But for now, here’s where we are: the conventional wizdom in the Land of Oz was that if there was something lacking in your life that no ordinary human, munchkin, witch, or flying monkey could fill, there was a great and powerful wizard who could do anything, including meet the very need that you had, no matter what it was. He could give you a new heart, restore your strength and courage, renew your mind, and, most importantly, take you home. It is a story filled with hope: no matter what difficulties you face during your life in Oz, there is a wizard who has access to the wisdom, mysteries, and powers of the great beyond. If you respect, honor, and obey the wizard, you will be safe, receive everything you need, and will find the life you have always wanted. This is what Dorothy was told and what she put her hope in. But then a puppy dog pulled back the curtain, exposed the tragic truth, and shattered her belief. There was no great and powerful wizard in the Land of Oz. We start by introducing them to the Bible, the roadmap to all truth and, ultimately, to God. To help them accept that the Bible is the authoritative source of all truth, we . . . Utilize our interpretation of the prophecies in Daniel to show how the rise and fall of world empires along with the arrival of the Messiah were precisely predicted hundreds of years before they took place. Once people see the degree to which God fulfills prophecy, they will be convinced or re-convinced of the factual reliability and divine truth of the Holy Scriptures. At this point, we . . . Present the core scriptural teachings of orthodox Christianity—God, Jesus, Holy Spirit, Trinity, Salvation—and the corrective scriptural teachings that Adventists bring to bear on the Sabbath, the state of the dead, the nature of hell, the spirit of prophecy, the second coming of Christ, the investigative judgment, and more. With each teaching, we promise them that they will experience God’s richest blessings for believing in the Bible and obeying His commands. We may also warn them what could happen if they reject our clear scriptural teachings. But if they choose to accept our teachings, we will . . . Invite them to be baptized and join the Seventh-day Adventist Church. As we celebrate their baptism, we promise that they will not regret this decision, that their lives will be forever changed for the better, and that there will be a peace and joy that God’s spirit will put in their soul that cannot be taken away because they have come to understand the truths revealed in our propositional teachings. Boom. Drop the mic. Walk off the stage. Nailed it. The Adventist wizard has saved another soul. We can no longer expect people to believe that the Bible is a source of all truth and that we have the best understanding of it. Especially in large urban areas and along the coasts of North America, there is quickly becoming a prejudice against the Bible and those who push it. In these areas, Christians are seen as more immoral than agnostics and atheists. To assume that people respect the scriptures and attempt to take them through our constructs of Bible prophecy is pure folly. Most people will not even give us a chance to share our doctrinal understandings. If they do give us an opening to share, they will pull out their smartphones and show us dozens of articles that counter our teaching with other interpretations. We cannot prove the superiority of our scriptural interpretation. If preaching and studying the Bible is the way we introduce ourselves to the community, we have failed before we even begin. We as Adventists have been obsessed with proving ourselves to the world as the Great and Powerful Oz. We promise our converts that if they accept us as God’s true and faithful wizard, they will gain access to the Divine and find the deepest needs of their souls met. But there is now too much evidence and too many stories of how our converts have put this claim to the test and discovered that it is often a big, fat lie. They pulled back the curtain and exposed the feeble, dying church that is scurrying around trying to keep the illusion up, telling itself and everyone else that the projected image is still true. Tragically, converts often draw the subsequent conclusion that if Adventist wizardry is a fraud, then Adventist’s promise of a loving and faithful God is also a lie. I have a hunch he might say this exact thing to us now. 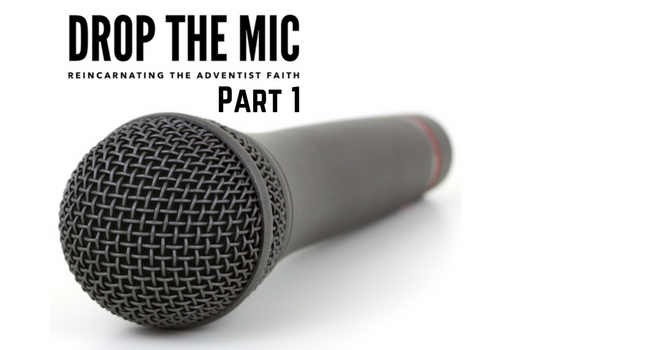 Is it time for Adventists to drop the mic for a different reason? Instead of punctuating the proclamation of our superior revelation of God with an authoritative thud, should we shut down our sound system, turn off the spotlights and the smoke machine, and fall before God and the people of our communities and admit that we have not been, are not now, nor ever will be the great and powerful wizard? Is it time to admit that, despite all the efforts by our denomination for the past century and a half, we have not been able to live up to the image we have projected about ourselves? That for all our bluster about the superiority of our teachings, they have not led to the transformations we hoped for? Should we finally come to terms with our flawed humanity and stop trying to be something we are not? I think we need to consider it—for Dorothy’s sake. Todd J. Leonard is senior pastor at Glendale City Seventh-day Adventist Church and president of Glendale Communitas Initiative, a local non-profit organization devoted to families working their way out of poverty. He shares life with his wife, Robin, and three daughters, Halle, Abigail and Emma. 5. John 5.39-40, 42-43a. The Bible: New Revised Standard Version.